The first prints from my Death Valley and Eastern Sierra photography trip will debut at Art Works on Friday, March 22nd. If you are able, please come by to see the prints and say hi! Each image is presented as a 16×24-inch print, framed to 22×28 inches. 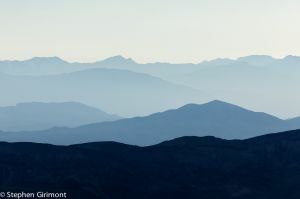 The first image, “Amargosa Blues,” was taken from the area known as Dante’s View in Death Valley National Park and is looking east, away from Death Valley. It was extremely windy that day, and the dust and sand being kicked up by the wind contributed to turning the distant Amargosa Mountains varying shades of blue. It was also extremely cold atop Dante’s View that morning and the temperature, combined with what must have been 40 to 50 mph winds, means I didn’t stay very long. Basically, I saw this scene, grabbed my camera, shot it, and ran back to the car before freezing to death. The second image, “Harsh Desert,” was taken near the Eureka Dunes in the northern part of Death Valley National Park. 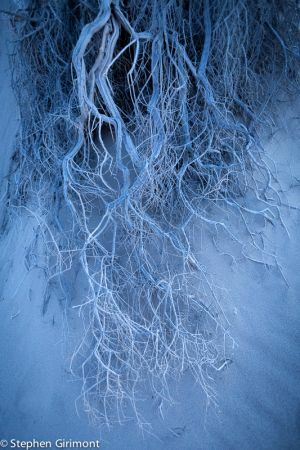 It was taken about an hour after sunset, in the deep blue of twilight, and shows a bush’s root system that had been exposed due to the shifting sands. 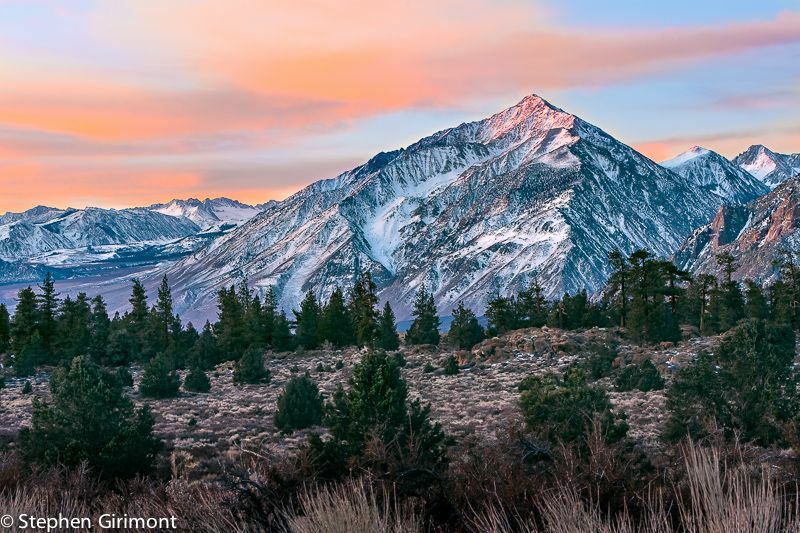 The third image, “Mount Tom,” shows the afore-mentioned Mount Tom, located just outside of Bishop, California, as the sunrise is just touching the top of the mountain. Two days of off-and-on snow in the Sierras prior to that morning painted the mountain with just the right amount of snow for this wonderful image.